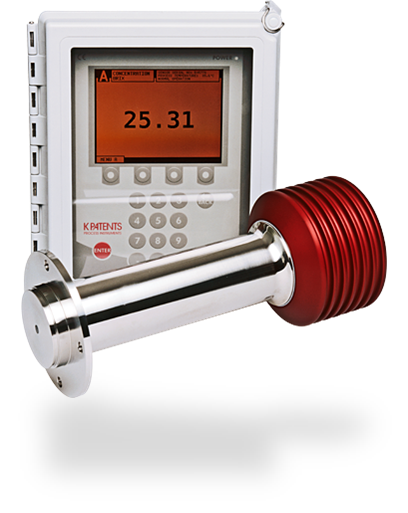 K-Patents compact sanitary refractometer PR-43-AC measure Brix and concentrations in pipe lines. Easy to install in any pipe size directly or via flow cell. For all food and beverage processing applications where in-line monitoring and control can help to improve product quality and reduce costs. It withstands high process temperatures up to 130°C, CIP and SIP processes, cleaning and rinsing of facilities. The refractometer has a measurement range of 0 to 100 Brix and provides an Ethernet or 4–20 mA output signal proportional to the temperature-compensated Brix value for real-time process control. 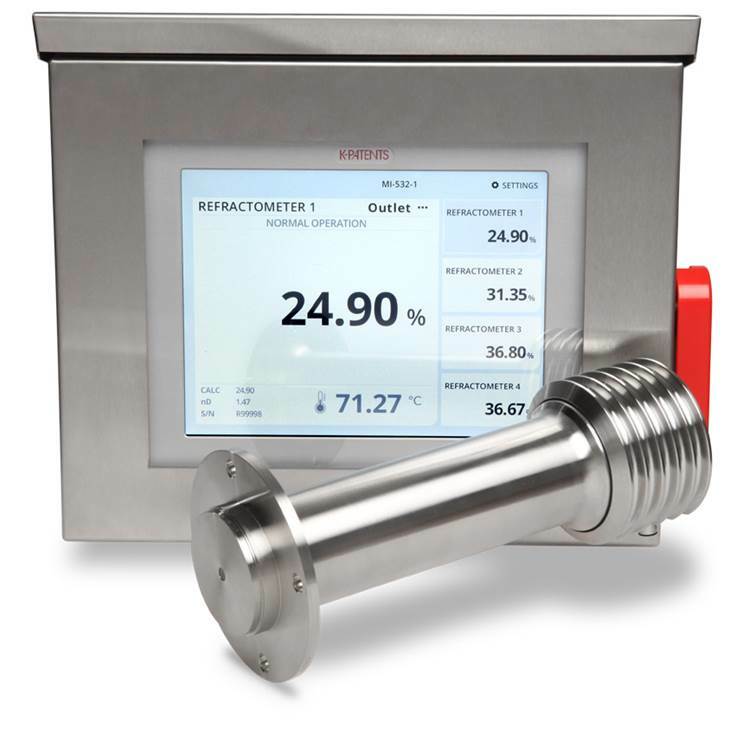 PR-43-AC Refractometer has a built-in web server with an instrument homepage for configuring, monitoring, verifying and diagnosing the refractometer via an Ethernet connection. There are three graphical user interfaces: Web (direct) is standard, Compact option (display), Multichannel option (up to four channels). The refractometer does not require any recalibration or regular maintenance. The calibration of each refractometer can be verified using standard refractive index liquids and a built-in verification procedure. 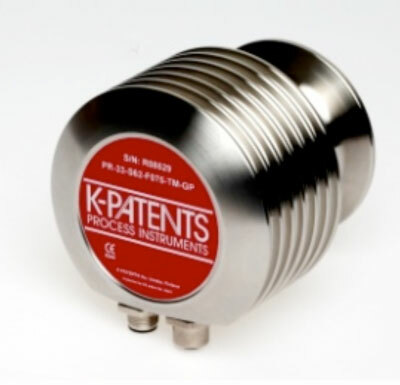 K-Patents Pharma Refractometer PR-43-PC measure Brix and concentrations in pipe lines. Used for equipment qualification in lab, pilot and production. Meets the pharmaceutical industry standards and guidelines including PAT (Process analytical technology) GMP, CIP/SIP. Fulfills the pharmaceutical drug production regulations for process wetted part materials, sealing and surface roughness. No animal derived ingredients are used in the machining and polishing processes. It has FDA 21 CFR Part 11 compliant electronic data capture and storage technology. Full IQ/OQ documentation is available for the fulfillment of the equipment qualification. A Laboratory test cuvette LTC is designed for off-line testing with static or continuous sampling in laboratory and pilot batch, in order to validate refractive index as an analytical method. When all required validation standards have been met, then the Pharma Refractometer can be installed in the production process for in-line control. The benefit of using the Laboratory Test Cuvette is that it allows the use of the same refractometer in all test faces as well as pilot and full scale production. 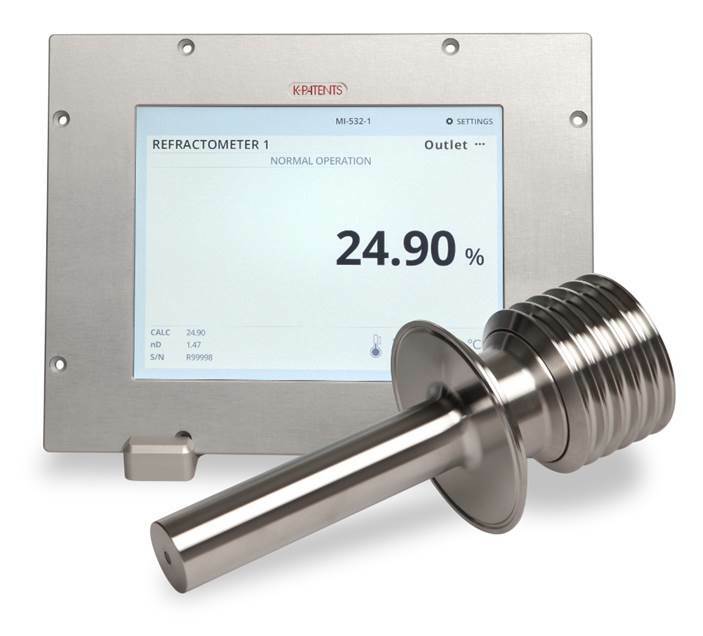 The K-Patents Sanitary Probe Refractometer PR-43-AP provides an accurate in-line BRIX measurement in large pipelines, tanks and cookers. The flush mounted sensor allows the use of scrapers in cooking installations. It is also easily installed through a steam jacket. Product quality and batch times can be precisely controlled without costly sampling. 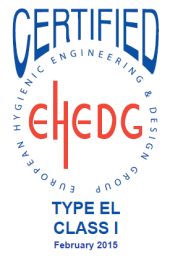 It withstands high process temperatures up to 150°C, CIP and SIP processes, cleaning and rinsing of facilities. The refractometer has a measurement range of 0 to 100 Brix and provides an Ethernet or 4–20 mA output signal proportional to the temperature-compensated Brix value for real-time process control. 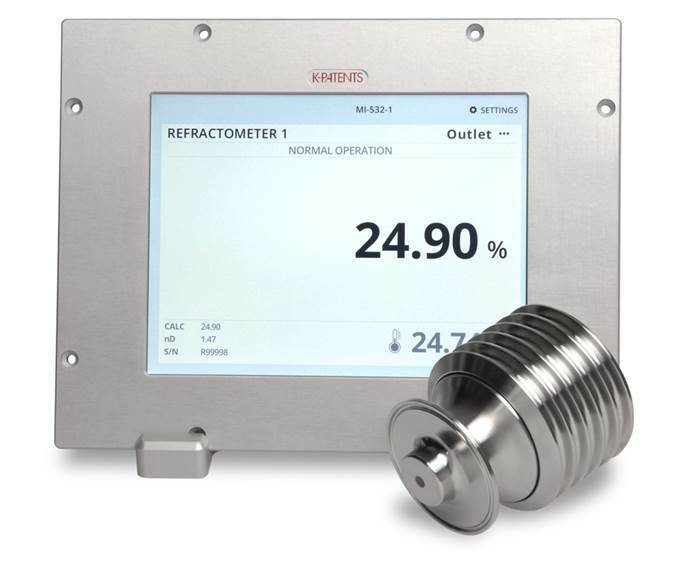 PR-43-AP Refractometer has a built-in web server with an instrument homepage for data logging, configuring, monitoring, verifying and diagnosing the refractometer via an Ethernet TCP/IP connection. There are three graphical user interfaces: Web (direct) is standard, Compact option (display), Multichannel option (up to four channels). The refractometer does not require any recalibration or regular maintenance. The calibration of each refractometer can be verified using standard refractive index liquids and a built-in verification procedure. 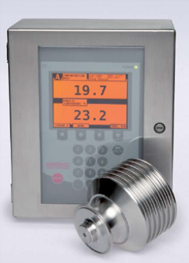 The PR-23-AC compact sanitary Brix meter measure continuously Brix and concentrations in pipe lines. Easy to install via flow cell or directly in any pipe size with a 3A sanitary clamp of Varivent® clamp. For all food and beverage processing applications where on-line monitoring and control can help to improve product quality and reduce costs. Ethernet TCP-IP server built for data logging, uploading parameters and software. 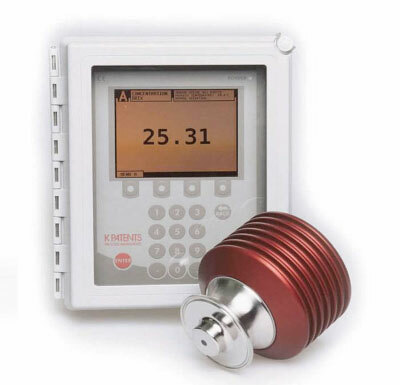 Dual connection of two sensors PR-23 to a single transmitter provides an additional measurement that may be used in another application. The Pharma Refractometer PR-23-AC meets the pharmaceutical industry standards and guidelines. These include PAT, GMP, CIP/SIP, 21 CFR Part 11 and validation. The ability to understand and continuously control Refractive Index nD contributes significantly to the development of effective drugs and efficient manufacturing processes. The Pharma Refractometer PR-23-AC fulfills the pharmaceutical drug production regulations for process wetted part materials, sealing, and surface roughness. No animal originated media are used in the machining and polishing processes. 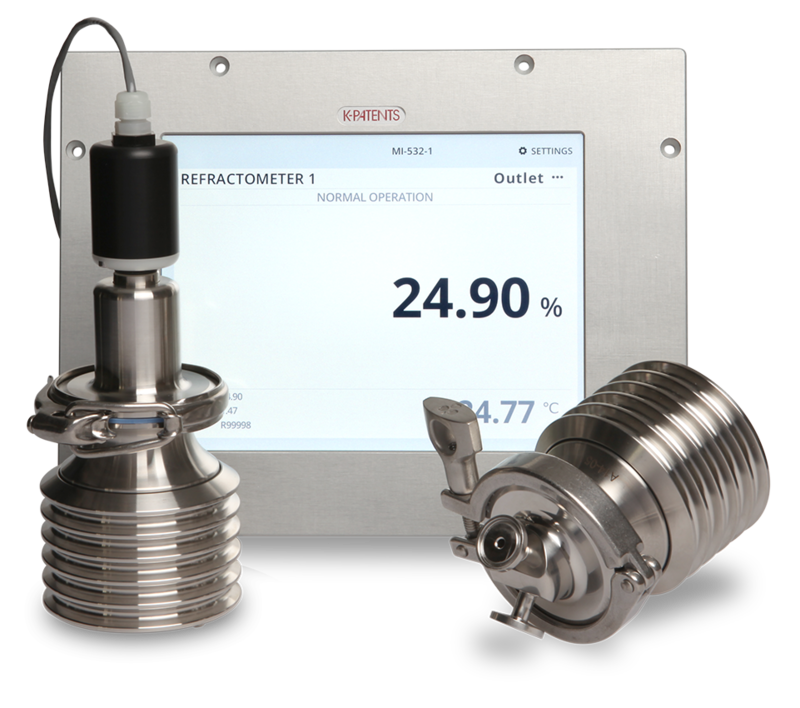 Each sensor is provided with a calibration certificate comparing a set of standard liquids to the actual sensor output. Therefore, the calibration and accuracy can be routinely verified with the traceable standard Refractive Index liquids. Validation often includes the qualification of systems and equipment. It is a requirement for Good Manufacturing Practices (GMPs) and other regulatory requirements. 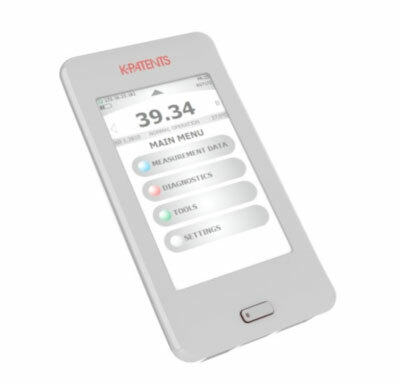 K-Patents provides a validation procedure and equipment that help the user to prove the suitability of the refractometer for its designated function. These include an optional laboratory test cuvette for easy off-line testing of drug samples in the laboratory. The PR-23-AP compact sanitary probe Brix meter measure continuously Brix and concentrations in tanks, cookers and large pipe lines. The flush mounted sensor allows the use of scrapers in cooking installations. It is also easily installed through a steam jacket. Product quality and batch times can be precisely controlled without costly sampling. It withstands high process temperatures up to 150°C, CIP and SIP processes, cleaning and rinsing of facilities. For all food and beverage processing applications where on-line monitoring and control can help to improve product quality and reduce costs. Ethernet TCP-IP server built for data logging, uploading parameters and software. Dual connection of two sensors PR-23 to a single transmitter provides an additional measurement that may be used in another application. The OEM Sanitary Process Refractometer PR-33-AC is a light, compact style refractometer model designed to meet the needs of original equipment manufacturers (OEMs) and integrators serving beverage, dairy and food processing industries. 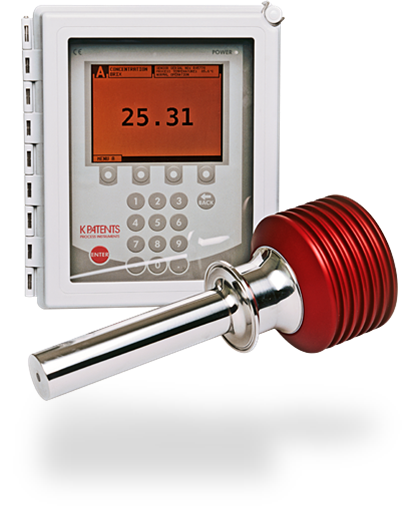 The brix meter measure continuously Brix and concentrations in pipe lines. Easy to install via flow cell or directly in any pipe size with a 3A sanitary clamp of Varivent® clamp. For all food and beverage processing applications where on-line monitoring and control can help to improve product quality and reduce costs. Ethernet TCP-IP server built for data logging, uploading parameters and software.